Book with a name you can trust! Luxury 5* Deluxe Crystal Awarded Nile cruise boats with all meals included. Top of the range 5* hotels. All airport taxes and service charges. Full ABTA & ATOL protection. Choose from our luxury collection below of 5* Deluxe Nile cruise boats and hotels in Cairo, Luxor and Red Sea. Many more options available, please enquire. For centuries travellers have been fascinated by the mystical allure of the Nile. 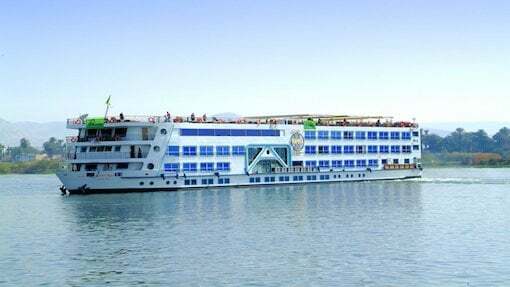 A relaxing cruise in luxurious surroundings, alongside Egypts many archaeological wonders, provides the perfect combination for an unforgettable holiday.Our Classic Nile Itinerary takes you from Luxor to Aswan, visiting some of the most spectacular ancient sites in the world including the stunning Valley of the Kings, the burial place of the Pharoahs including that Tutankhamen and the breathtaking temples Karnak and Luxor. 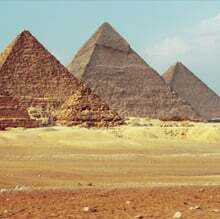 Cairo is a must for anyone fascinated by the magnificent Great Pyramids and the Sphinx of Giza. Situated on the Nile, Cairo is exciting, vibrant and fascinating; it is a perfect blend of old and new. Take time to explore the treasures of Tutankhamen in the Egyptian museum or take a stroll around the bustling Khan El Khalili bazaar. Away from the city centre, there is still more to see from the capital of ancient Egypt at Memphis to the Step Pyramid at Saqqara. Combine this with the wonderous Red Sea with clear blue waters, golden beaches and Luxury Hotels to create a truly relaxing holiday. Traditional in style, with modern arabesque architecture and unique interior design, El Gouna which is situated twenty kilometres North of Hurghada offers a fine selection of hotels. All the hotels and resorts are located in idyllic settings between the majestic mountains of the desert and the clear blue waters of the Red Sea surrounded by natural and artificial lagoons designed to form the shape of a star. One of Egypts premier leisure destinations, visitors can mingle with the locals, explore the Old Town where both quaint and sophisticated shops, offering both International and local products, are vying for passing trade. Dining options are plentiful and varied with restaurants, cafes, bars and local inns all within easy reach. Entertainment and sports are plenty-full with an open air cinema, go-karting, museum, an aquarium and of course swimming during the day. For night owls there are nightclubs to dance the night away. With an eighteen hole Championship golf course catering for golfers in this calm and relaxing oasis, El Gouna has something for everyone. Originally a sleepy, remote fishing village, Hurghada has become one of the liveliest and busiest resorts in the Red Sea whilst retaining the character and charm of bygone days. The resort boasts all the facilities of a modern Egyptian city without losing its timeless desert quality. Some of the finest underwater gardens in the world offshore beckon snorkellers and divers alike to experience the beautiful corals and spectacular marine life for which the Red Sea is renowned. Hurghada has a fine selection of quality hotels with water sports facilities that include windsurfing, sailing, deep sea fishing, swimming, colourful bazaars and a lively varied nightlife. Hurghada is a haven for water sports enthusiasts and sun seekers. For those who want to glimpse the wonders of the Red Sea without getting wet, you can visit the Red Sea Aquarium. As an alternative you can dive to dizzy depths in comfort, aboard the Sinbad Submarine. Another window to the underwater world of the Red Sea is offered to you on board a glass-bottom boat. Merging the old with the new, Hurghada has something to offer those interested in the history of the resort with excursions to Roman sites or the monasteries of St.Paul and St.Anthony. Friday, Saturday, Monday or Wednesday departures from Heathrow, Gatwick, Manchester, Birmingham or Glasgow. Newcastle or Edinburgh via Heathrow. Depart UK. Upon arrival met and transferred from Luxor airport to your cruise vessel, dinner and overnight stay in Luxor. After an early breakfast, visit the West Bank including the Colossi of Memnon, Valley of the Kings and the Valley of the Queens, burial sites for many of the most powerful and successful pharaohs and high priests. The Temple of Hatshepsut and Medinet Habu Temple. Lunch on board as the boats sets sail to Esna dinner on board. Overnight in Esna. Breakfast on board and morning visit of the Temple of Khnum at Esna. The temple is dedicated to the ram-headed god Khnum, who was patron god of cataract. He is said to have fashioned mankind from Nile clay on a potter's wheel. We continue our journey south to the Temple of Edfu for a brief stop before lunch and sailing to Aswan and overnight. After breakfast visit the High Dam in Aswan, built in 1960-1971 to provide electricity to the villages along the Nile, the Unfinished Obelisk and the Temple of Isis on Philae Island. Lunch on board. In the afternoon is free time on board or to stroll into Aswan city centre for shopping. Dinner on board and overnight in Aswan. Optional evening sound & light show priced at approx. £25.00 pp. Optional early morning visit to Abu Simbel (priced at approx. £85 pp by road or £210 pp by air), the impressive site built by Rameses II to show his strength and power. Abu Simbel stands on the bank of Lake Nasser. Afternoon a relaxing and enjoyable boat trip around Elephantine Island and sail to the Botanical Gardens on General Kitchener Island. Dinner and overnight in Aswan. Morning at leisure. Lunch on board and set sail to Kom Ombom to visit the temple. This temple, unlike many others in Egypt, was dedicated to two gods; the Southern section is dedicated to Sobek, the crocodile headed man, god of fertility, and the Northern section to the Falcon headed god Horus. There is also a fascinating crocodile museum to visit with many artefacts and mummified crocodiles. Set sail to Edfu and overnight. Breakfast on board and sail to Luxor. In the afternoon visit the East Bank and Luxor Temple. Originally, the temple was joined to Karnak by a long avenue of Sphinxes, many of which are still able to be seen today. Followed by a visit to the world's largest greatest open air museum' known as Karnak, which covers a large area of land and includes several temples, the largest of them being the Temple of Amun. Overnight in Luxor. Breakfast followed by checkout and transfer to Luxor international airport your short flight to Cairo. On arrival you will be met and transferred to the hotel of your choice in Cairo for your 2 nights stay. Optional Balloon flight excursion at sunrise priced at approx. £120 pp. Optional, Depart morning to Memphis, the ancient capital of Egypt and then to Saqqara, where the Step Pyramid built by King Djoser, the first Pharaoh to have his tomb built in monumental dimensions. His enormous Step Pyramid stands as a symbol of strength and powerful state, with the divine king at its centre. After lunch, the tour continues to Giza, where the famous Pyramids stand as monuments to the Pharaohs of Ancient Egypt and the Great Sphinx, which has kept its secrets for centuries. Optional, Depart after breakfast to The Egyptian Museum, containing fabulous treasures from Egypts ancient past including the magnificent Tutankhamun collection. After lunch, the tour continues to the Citadel, a fortress built in 1183 AD, which houses a number of important monuments, including The Mosque of Mohamed Ali and Al-Gawahara Palace. The day finishes with a visit to the Khan el Khalil Bazaar. Transfer to Cairo airport for your short flight to Hurghada or Sharm El Sheikh. Relax on the wonderous Red Sea with clear blue waters and golden beaches. Transfer to Hurghada airport for your return flight home. The road transfer from Luxor to Hurghada and Makadi Bay takes approx. 4 hours and El Gouna approx. 4.5 hours. For the deal of the day speak to one of our experienced Travel Consultants.